Enclosed and attached is the information relative to the 30th Isodarco Winter Course (www.isodarco.it). We hope that you will find this information of interest and you will join us in this intellectually challenging experience. We also hope that you will pass this information to your friends and colleagues and forward it to your mailing list. Attached is a pdf poster that you can print on European or American standard paper sizes, we hope that you will kindly post it on your bulletin board. The search for the ultimate weapon has always motivated military planners and engineers to exploit for military purposes new scientific discoveries and technological advances, thereby causing qualitative arms races. The breadth and pace of development in computers, networks, robotics and artificial intelligence suggests the emergence of new generations of weapons, in cyberspace and in the physical world, that will be compact, unmanned and, perhaps, with independent decision-making capability. Could the speed of action-reaction in future conflicts require to put humans “out-of-the-loop”. This conclusion would be quite dangerous, because autonomous weapon systems, in cyber and real space, will inevitably be prone to serious hardware limitations and unreliability, design and programming errors, deception, tampering or, simply, hacking. 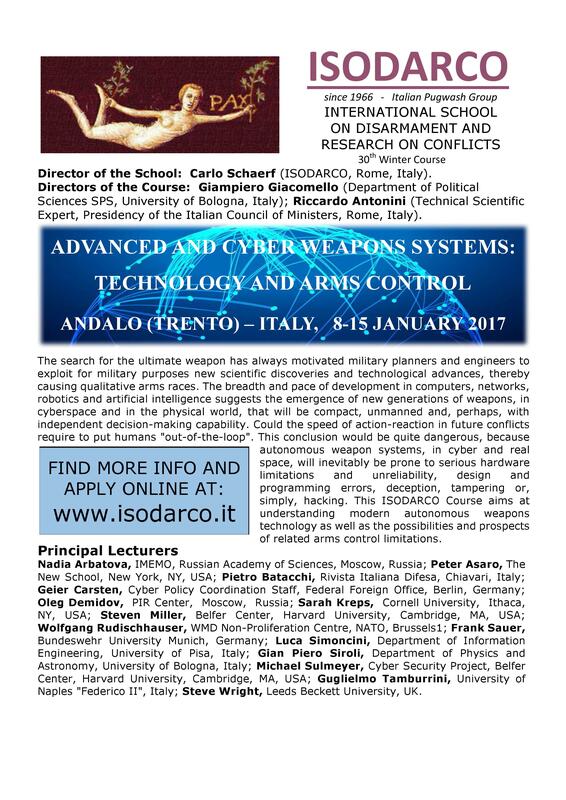 This ISODARCO Course aims at understanding modern autonomous weapons technology as well as the possibilities and prospects of related arms control limitations. Nadia Arbatova, IMEMO, Russian Academy of Sciences, Moscow, Russia; Peter Asaro, The New School, New York, NY, USA; Pietro Batacchi, Rivista Italiana Difesa, Chiavari, Italy; Geier Carsten, Cyber Policy Coordination Staff, Federal Foreign Office, Berlin, Germany; Oleg Demidov, PIR Center, Moscow, Russia; Sarah Kreps, Cornell University, Ithaca, NY, USA; Steven Miller, Belfer Center, Harvard University, Cambridge, MA, USA; Wolfgang Rudischhauser, WMD Non-Proliferation Centre, NATO, Brussels1; Frank Sauer, Bundeswehr University Munich, Germany; Luca Simoncini, Department of Information Engineering, University of Pisa, Italy; Gian Piero Siroli, Department of Physics and Astronomy, University of Bologna, Italy; Michael Sulmeyer, Cyber Security Project, Belfer Center, Harvard University, Cambridge, MA, USA; Guglielmo Tamburrini, University of Naples “Federico II”, Italy; Steve Wright, Leeds Beckett University, UK. English will be the working language of the School. There will be approximately 80 participants who are xpected to attend all lectures and seminars and to stay for the whole of the week-long course. Applications should be submitted with the following information, compulsory even for those who have previously attended Isodarco sessions: full name; date and place of birth; gender; present full address (including e-mail address, telephone and fax numbers, if available); nationality; Degree and/or other academic qualifications; current professional activities and work address; list of publications and fields of interest; in lieu of publications, a letter of recommendation from a professor or a scholar in the field. 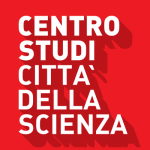 Applications should be submitted on-line at www.isodarco.it or sent by email to the Director of the School: Prof. CARLO SCHAERF at isodarco@gmail.com Applicants who need a visa to come to Italy should apply to Isodarco by October 10^th , 2016, indicate in their application to which Italian Consulate they intend to apply and apply for the visa immediately after being accepted to attend the School. Many Italian Consulates are reluctant to grant visas for a course that lasts only one week and therefore the applicants must provide the Italian Consular Authorities with evidence of their professional qualifications and their specific professional interest in the topic of the course and that their only reason to come to Italy is to attend the Isodarco course. Isodarco, as a NGO, is not able to influence the decisions of the Italian Consular Authorities. *Applicants who do not need a visa should apply by November 7^th , 2016. *Applications will be considered by the Organizing Committee on the basis of the information submitted. All applicants will be informed of the Committee’s decision as soon as possible and before November 14^th , 2016 (those who need a visa before: October 17^th). Participants are requested to arrive at Andalo any time on Sunday, January 8^th , 2017 and leave in the morning of Sunday, January 15^th , 2017. The course ends on Saturday afternoon. The registration fee, which includes attendance, accommodation and full board, is 500.00 Euro. A reduced fee of 300.00 Euro is applied to students with no income born in 1991 or after and to participants from Countries with foreign currency problems. If you wish to be considered for a reduced fee you must explain in your application why you qualify for it. Participants will be housed in double or triple rooms at Hotel Gruppo Brenta or nearby hotels or residences. The registration fee for single rooms, if requested and available, will be 800.00 Euro; participants asking to share a room with somebody in particular, if possible, will be charged an additional 50.00 Euro per person. A limited number of family members can be accommodated at the Hotel Gruppo Brenta or nearby. Room and board for each person is 550.00 Euro for the entire period. Given the limited number of places for families, each request will be examined on an individual basis. Participants wishing to bring their family are requested to submit their application as soon as possible. The school has no funds to help participants to meet travel and registration expenses. The Course will be held at Hotel Gruppo Brenta (http://www.gruppobrenta.it), via Strigole 1, 38010 Andalo (http://www.andalovacanze.com/en/) (Trento), Italy. Tel. (+39) 0461 585813, Fax (+39) 0461 585269. Participants wishing to submit a paper for seminar consideration should enclose a short abstract of their proposed contribution in their application. The Director of the School will reserve some limited time for seminars considered particularly relevant to the program of the Course. The Organizing Committee reserves the right to introduce any necessary change to the program. The registration fee can be paid with a bank draft to the Isodarco bank account or with Credit Card through PayPal. After you have been admitted and secured your Visa (if necessary) pay the amount indicated in your letter of admission before Sunday December 11^th 2016. Your admission will be confirmed only after we have received your payment.